¶ 4 Leave a comment on paragraph 4 0 GIS organizes and integrates sources on the basis of their shared geographic location, which in the case of an urban setting means their street address. Working with addresses involved thinking about Harlem on a much smaller scale than had other scholars.5 Maps in existing historical studies focused on showing the boundaries of the area dominated by black residents and the location of a handful of landmarks, at a scale that located Harlem in upper Manhattan, the area above Central Park. 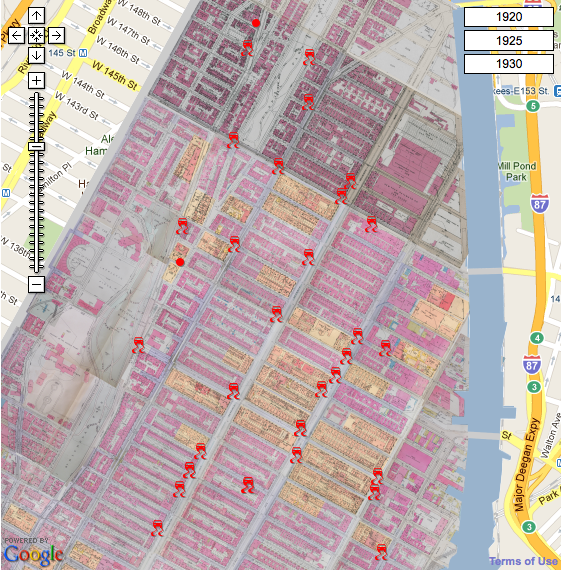 With a street map as the background, the area around the boundaries and landmarks appeared only as undifferentiated space.6 To fill the spaces in these maps, to recreate Harlem at the scale of individual addresses, I turned to a real estate atlas from 1930, from which the ACL eventually created a map to overlay on Google Maps. Real estate maps include the footprints of buildings, with information on how many floors high they stood, on the materials from which they were constructed, and on the presence of elevators and stores.7 In other words, these maps literally fill in the blocks of the street map, helping, as Ian Gregory and Paul Ell put it, to “subdivide the place under study into multiple smaller places and give some indication of how these places interact.”8 Thinking about Harlem at this scale, you are immediately confronted with how imprecisely most historical scholarship treats location: events and buildings are not given an address, or given only a partial or incorrect address, and little attention is paid to how that location is related to other places, to what is proximate or distant. It is enough to say that the places mentioned are somewhere in Harlem. ¶ 6 Leave a comment on paragraph 6 0 Examining Harlem at a smaller scale involved me in what Karen Halttunen identified as the second wave of the spatial turn in humanities scholarship, the move from constructing a spatial analysis that “tended to the metaphorical” and employed the “idiom of borders and boundaries, frontiers and crossroads, centers and margins,” to a concern with “spatial issues more materially.”9 While you could argue that my work is spatial history not digital history, this would ignore the extent to which such mapping is not just enabled by digital tools, but really only possible when you use such tools. Real estate maps are so small in scale that they cannot be reproduced in print publications, with those covering Harlem amounting to almost an entire atlas volume. However, digitized and overlaid on Google Maps, real estate maps become scalable, making it possible to zoom out from individual buildings to the neighborhood view favored in historical maps of Harlem, and to an even larger scale that situates upper Manhattan in the larger city. ¶ 10 Leave a comment on paragraph 10 0 What distinguishes Digital Harlem from The Valley of the Shadow is not only its sources–legal records and newspapers–but also that the database contains everything in the sources that is associated with an address. The geospatial database allowed us to incorporate and organize a range of material that historians typically treat as ephemera, or pass over it as too sparse or fragmentary to support an analysis. From the newspapers, we took not just the news stories on which scholars typically focus, but also the society columns, sports reports, news from churches and fraternal organizations, and advertisements. From the legal records, we took every offense, not just a particular crime or group of crimes, and information on the victim and witnesses as well as the offender, on the nature of the crime’s location, and on the circumstances in which it occurred, which ranged from card games to shopping trips. The range of activity captured by Digital Harlem can be seen in the list of event types in the database (figure 4). (Crimes constitute a minority of the events in the database, but are prominent in that list because the variety of different offenses in the law effectively disaggregates crime more than the categories we have used for other events). Recurrent events such as plays, movies, church services, and street speakers are not included as event types but instead can be located by searching by location type for their venues. At the same time, the need for a location excluded some material; every newspaper issue included some stories that did not include an address, and therefore could not be included in the database. So, as much as the database offered a way to bring together a wide range of material, it was not a means of creating a ‘total history,’ an all-encompassing picture of everyday life. ¶ 12 Leave a comment on paragraph 12 0 In making it possible to place the contents of a database on an online map, GIS takes advantage of one of the core properties of the digital medium, that it is visual, an aspect that historians have been slow to develop, exploit and make integral to historical analysis.12 As Trevor Harris, Jesse Rouse and Susan Bergeron argue, “The visual display of information creates a visceral connection to the content that goes beyond what is possible through traditional text documents.”13 (That contrast is evident in a comparison of how traffic accidents appear in the database (figure 3) and displayed on the map (figure 6)). It is not just that mapped data is seen in its geographical context. Layers of different data, and hence large quantities of data, can be combined on a single map, providing an image of the complexity of the past. You can examine maps of sources at different scales, and “discover relationships…by visually detecting spatial patterns that remain hidden in texts and tables.”14 Those spatial relationships prompted questions I might otherwise have ignored and facilitated comparisons that I would not have considered. 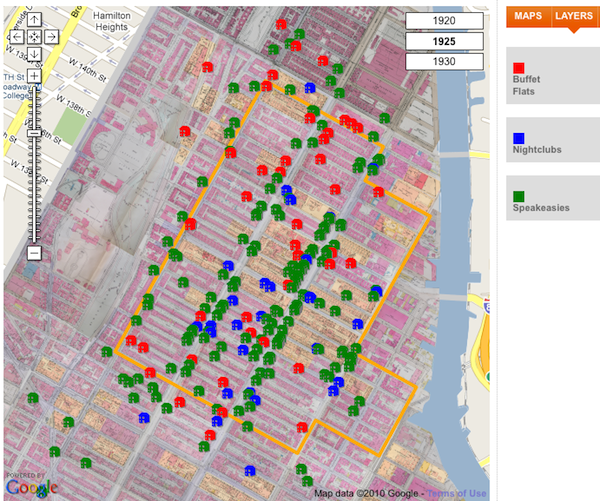 But there are definite limits to the visualizations created by Digital Harlem, and GIS in general. As Ian Gregory notes, “They provide a simple summary of the distribution of a variable in ways that attempt to stress the spatial by simplifying attribute [the characteristics recorded about entities in the database] and fixing time.”15 The patterns evident on these maps reveal “where,” in the process asking, but not explaining, “why there?”. Nonetheless, pursuing answers to such questions changed the way I thought about Harlem’s past, and gave me a different perspective on the neighborhood. ¶ 16 Leave a comment on paragraph 16 0 Traffic accidents offer another example of how Digital Harlem changed how I thought. In the first instance, I would not have paid attention to these incidents if I had not been entering every event that had a location into the database. Reports of accidents appeared regularly in black newspapers, but usually amounted to no more than a few sentences. A map of that information (figure 6) showed accidents throughout the neighborhood, concentrated on Seventh and Lenox Avenues, which ran north-south the length of Harlem. These avenues have long been recognized as occupying a central place in Harlem life. Christened the “Black Broadway” by writer Wallace Thurman, Seventh Avenue featured the nightlife visited by thousands each evening in the late 1920s, and many of Harlem’s major churches, which drew large crowds each Sunday. On the sidewalks of both avenues, individuals went “strolling,” donning their best clothes took to display their style, to socialize with friends and to meet strangers. Men and women collecting bets on the numbers occupied the corners each weekday morning, replaced in the evenings by prostitutes. On weekends, residents paraded in the avenues themselves, with their fraternal lodges, as members of the UNIA or in funeral processions.17 However, in addition to these well-known activities, the two avenues saw more traffic than any other roadway north of 59th Street, most of it travelling through the neighborhood en route into and out of the city, joined in the evening by fleets of taxis bringing visitors to Harlem’s nightlife. Public transport also ran on both avenues: street cars travelled on Lenox from 116th to 148th Street, and double-decker buses ran on Seventh from 110th to 155th Street. ¶ 20 Leave a comment on paragraph 20 0 Within Harlem, while Morgan Thompson and his family lived at the same address on West 144th Street for over a decade, many black families regularly relocated. Perry Brown, a forty-five year old on probation for stealing coats to pay for his wife’s medical care, relocated five times in three years, not simply to get better housing but sometimes to get rooms to lease to boarders, or premises easier for his wife to maintain, or when he could not pay the rent.23 The variety of apartments Brown and his wife occupied highlights the range of housing that existed in Harlem beyond the overcrowded tenements and middle-class dwellings that typically draw attention. Moreover, for all the upheaval attending relocation, mapping the Browns’ homes highlights that for Harlemites moving generally only involved shifting a few blocks, with little likely disruption of their relationships and involvement in the community. ¶ 21 Leave a comment on paragraph 21 0 Working with Digital Harlem also led me to write in a different form, a blog.24 This online writing is typically seen primarily in terms of length, as a short form, but what shaped my blogging was its relationship to other forms of digital history and historical writing. In the first instance, blogging provided a way to supplement Digital Harlem. As the maps created on the site by their very nature raise questions rather than answering them, they could not simply stand on their own online. Digital Harlem required additional context; a blog provided a medium linked to the site in which to tell stories about the maps. In addition, Digital Harlem’s maps are difficult to incorporate into print publications: dynamic maps have to become static, without scalability or links to the database of sources; and colored visualizations have to be reproduced in black and white, limiting the layers and quantity of data that can be included. Included in a blog, screenshots of the maps retain their color and can be linked to the site. They also can be supplemented with images, which are not currently in the database and for which space is limited in print publications. The blog posts thus can also provide a form of footnote to traditional published writing, where I can elaborate in more detail a topic that there is only space to touch on in a print article. Relative to a published footnote, the blog is a longer form. Obviously, online the blog can serve both as a context for Digital Harlem and as a reference for a print publication. ¶ 23 Leave a comment on paragraph 23 0 Recently, as I realized I had considered the blog only in relationship to my project not to the larger Internet, Digital Harlem has led me to another form of online writing. I began this project implicitly subscribing to the “build it and they will come” assumption that underlies much digital history, the idea that going online immediately delivers an audience. It doesn’t. Search engines bring some users, but attracting more requires connecting your work to the rest of the web. Following the lead of other digital projects, I have turned to Wikipedia. I had hoped to merely add links to existing articles, but the originality of Digital Harlem means that few of the topics it deals with were mentioned. As a result, I have had to write contributions to articles, grappling with Wikipedia’s wariness about primary sources, blogs and citing yourself, and with the existing organization of the articles related to 1920s Harlem.27 The challenges of writing for Wikipedia are well documented elsewhere in this collection; what my experience adds to that discussion is an example of why such engagement is more meaningful to digital historians than to other scholars, and hence something not to be left to students. ¶ 25 Leave a comment on paragraph 25 0 About the author: Stephen Robertson is an Associate Professor in the Department of History at the University of Sydney. He is currently working on a history of undercover surveillance in the US from 1865-1940, and collaborating with Shane White and Stephen Garton on “Year of the Riot: Harlem, 1935,” a project which will extend Digital Harlem into the 1930s. ¶ 26 Leave a comment on paragraph 26 0 Acknowledgement: Digital Harlem exists thanks to an Australian Research Council Discovery Grant (DP0343148), on which I collaborated with Shane White, Stephen Garton and Graham White, all due thanks for gathering the sources used in the project and for supporting the development of the site.